There is potential to improve government transfer payments through innovative payment systems that make it easier to issue funds, spend the benefit and automatically capture the accounting information. Such a system could be used for government transfer payments for a wide variety of purposes. Recipients would use a common method of receiving and spending many different payment types. A recipient would be immediately aware of having received the benefit and the value of the benefit. A controlled market could be created to capture the advantages of market economies while restricting products and services to the types intended. The funds associated with the benefit are not spent until the service provider claims from the government. Transfer payments not consumed by the recipient will automatically evaporate. A transfer payment is made without any exchange of goods or services. Examples of transfer payments include welfare (financial aid), social security and government making subsidies for certain businesses. Transfer payments are intended to achieve a social purpose. Those tied most narrowly are where "governments also provide other transfers in the form of concessions or payments that are linked to the purchase, or supply, of a particular good or service" but others including childcare, housing assistance and some aged care services are also intended for quite narrow purposes. Governments currently employ a variety of methods to ensure payments are directed towards the desired purpose. Innovative value transfer systems have been slow to develop in the information age and many have failed. "While electronic money has been an interesting problem for cryptography .., to date, the use of e-money has been relatively low-scale." Probably the most widely used information age payment system, Paypal is grafted on to previously existing card payment networks and provides barely distinguishable services. The Australian Reserve Bank has an interest in fostering innovation in Australian payment systems and government transfer payments should be part of that innovation. The recently completed Strategic Review of Innovation in the Payments System had "the objective of identifying areas in which innovation in the Australian payments system could be fostered through more effective cooperation between stakeholders and regulators." The review sees "the potential to unlock significant future innovation, resulting in ongoing improvements to the efficiency of the payments system.... the Board intends to be more proactive in setting out strategic objectives for the payments system, that is, its expectations for the services that the payments system should be able to offer in the future." As government transfer payments represent an important component of the payment system there is an opportunity to influence the direction of innovation in partnership with commercial partners. In standard payment systems value is fungible, meaning it is transferable for any purpose, but many government transfer payments are intended for a particular purpose and it is in this area that innovative payment systems can contribute. An innovative payment system could be used to create a closed economy where a payment can only be made to approved suppliers for intended purposes. Within that closed economy normal trading can occur. This is ideal for government transfers in the form of concessions or payments that are intended for the purchase, or supply, of a particular class of good or service e.g. laptops for school aged children. Bitcoin is a new payment system that is often though of as libertarian but it has characteristics that could be utilised for government transfer payments. Variants of Bitcoin, known as alt-coins could be used for transfer payments or aspects copied in alternative value transfer mechanisms. Most importantly, Bitcoin has been shown to work, is in active use and has a suite of tools and services under development. A level of granularity in transaction data and payment flows down to individual items or services is achievable and separate alt-coin currencies can be generated for each class of transfer payment. It is at least useful for exploring what is possible and the desirable characteristics of value transfer systems. The underlying mechanism is invisible to users making it simple to understand and use. It usually requires an internet connection and payment device which can be a PC application, a web browser app or smart phone app. However, paper based transactions are also possible. A person is presented with a bill, can use their smart phone camera to read the bill and can authorise the transaction with a key press. In the future it is likely that, using OpenPay, a consumer will be able to spend bitcoins at any merchant that is able to accept Visa or Mastercard. Because transactions are broadcast to the entire network, they are inherently public. Privacy is maintained through anonymous account numbers. Transaction data is captured as part of the transaction without requiring additional reporting. If the mapping is known, transactions can be traced from account numbers to individuals. In a government transfer system the government issuer would create that mapping. Bitcoin is an innovative payment system gaining traction but there are many others as described in the Electronic Money Wikipedia article and the RBA's Strategic Review provides a model for real-time retail payment and settlement hubs which includes a list of desirable characteristics. Most direct payments are not linked to the purchase, or supply, of a particular good or service and work well with current payment systems. 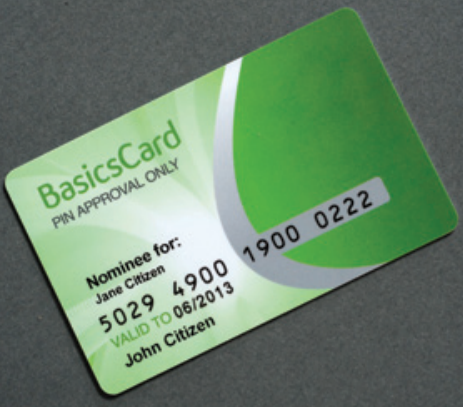 The BasicsCard is a stored value EFTPOS card provided by the Department of Human Services that allows purchases for authorised items from authorised merchants. The merchant enforces the restriction to authorised items and the EFTPOS system can't create an audit trail to verify this restriction. It has attracted some controversy but Jenny Macklin, the Minister for Families, advises "We've had it now operating for a few years; we know that it's helpful. The individual stories are very positive." It's proven there is a desire for government transfer payments to be directed to particular areas but the BasicsCard is limited to the options provided by the existing EFTPOS system and is not suitable for many forms of transfer payment, for example Renewable Energy Certificates. Innovative value transfer technologies can extend the BasicsCard concept. Some transfer payments are claimed through the tax return. This method is cumbersome, creates a delay between incurring the expense and claiming the benefit and puts a substantial administrative burden on claimants. An example is the Schoolkids Bonus formerly known as the Education Tax Refund. It is intended for expenses such as uniforms, books, school excursions, stationery and other costs like music lessons and sports registration fees. Previously, proof of expenditure was required by claimants but to reduce the administrative burden the requirement was removed so that the benefit is only notionally provided for the intended purpose. Innovative value transfer technologies could restore the original concept of directing the payment to the intended purpose and make the benefit available in an attractive form that can be spent rather than received as a refund. Sometimes governments directly provide goods and services when a superior outcome could be achieved by a transfer payment combined with market mechanisms. An excellent example is the laptops for schools program. Some students never got a machine. The machines supplied required tendering and administrative processes that introduced massive delays. There was a transfer from parents to government of the burden of ensuring responsible use and the $1,000 per machine supplied by the federal government proved insufficient to cover the machine and program costs so that in extreme cases parents were asked to contribute more per machine than the cost of a similar machine from a retailer. Use of the existing supply chain with an innovative transfer payment solution would have achieved a better result. Renewable Energy Certificates (RECs) are a tradeable voucher for encouraging investment in green energy initiatives. "Eligible renewable energy sources are entitled to create certificates based on the amount of electricity they produce or displace. These certificates can be created in the REC Registry and sold to buyers." These vouchers are quite different to payment systems like the BasicsCard but to an innovative value transfer system RECs would appear as just another value type and be traded in the same way a beneficiary trades their laptops for schools benefit. The trading system would automatically perform the function of the REC registry. 1. Australia's Future Tax System Review; Chapter 9: The transfer system; Australian Government; May 2010. I'm fond of ascending peaks. 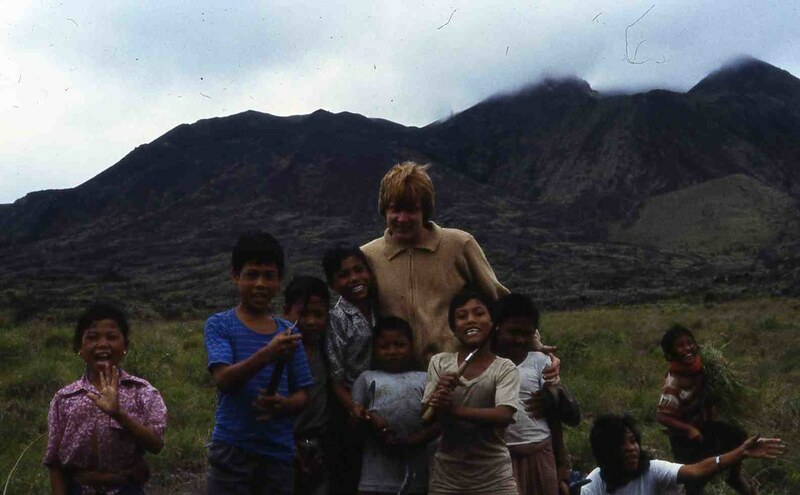 In 1980 my first peak outside Australia and first live volcano was Gunung (meaning mountain) Batur, Kintamani, Bali. Unlike nearby Gunung Agung, which is tough, it is a modest peak with a five kilometre ascent that takes two to three hours. That makes it great for a group looking for some adventure bonding in which everyone can participate. Strenuous enough to be memorable but not too difficult. This easy access is not ideal for the guiding profession so, on Batur, they counter with a hard sell. Locals don't use guides and while foreign visitors often like to be guided, many would prefer to climb on their own. Guideless climbers still need directions, particularly as Batur is usually climbed at night with the aim of being on the summit for the sunrise. There are multiple routes up the cone. The most used originates from a car park and from there proceeds up through the village, ascending the mountain by one route and descending by another. 3.00am to 4.00am is a good starting time to view the dawn from the summit. Animation of the most common route up Batur and some attractions along the way. The guiding office is near the car park and anyone starting from here without a guide will be accosted by the guiding enforcers. Climbers starting from elsewhere may be able to avoid this confrontation. If you are climbing at night without a guide you will need a route map as you will cross many paths leading elsewhere and sometimes the correct path is the least obvious. View Climbing Gunung Batur in a larger map with icon legends and route notes. The second icon is the carpark at the start of the climb and the first is at hotel Volcano III where we commenced. I recorded the route with My Tracks and it is available as a GPX file for import into your mapping app. Most people walk around the rim but some of our party didn't want to go further after reaching the summit. Alternatively, you could follow the torch light of another guided group but that may lead to trouble and is poor form if you have refused guiding services. Despite being a modest climb, my first ascent in 1980 seemed quite an adventure. I had no idea Batur was there until I arrived on a trail bike after traversing roads impassable to cars. The road close to Toya Bungkah in 1980 with the village in the background. 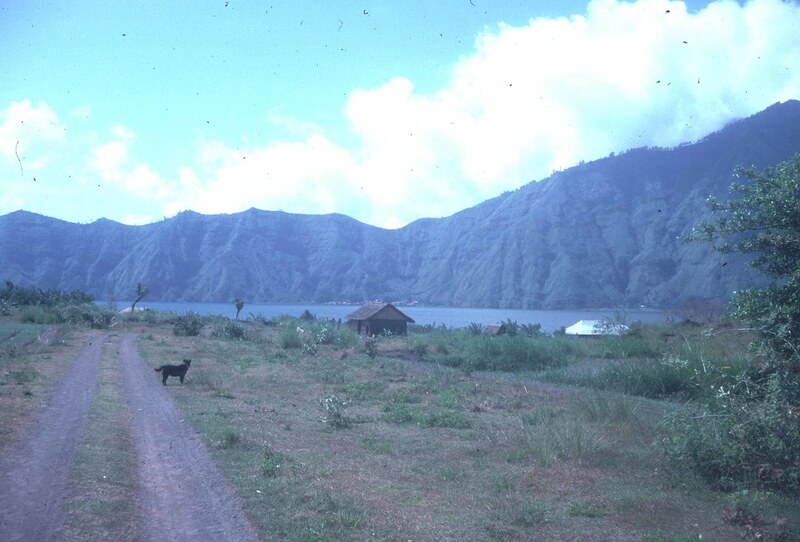 Image: Around Gunung Batur - in the past set. Heading towards Toya Bungkah probably close to Kedisan, the village at the bottom of the descent into the caldera in 1983. 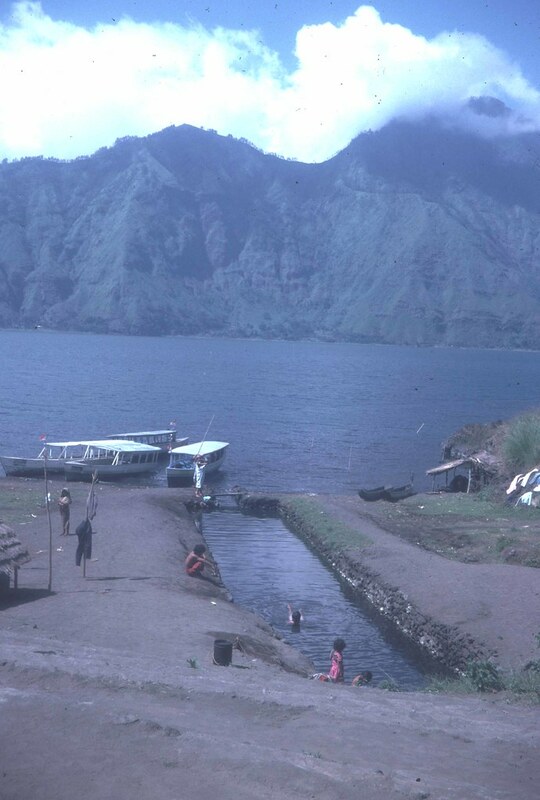 Image: Batur - Change From 1967 Until Now gallery. The road near Toya Bungkah in 2009, still nothing special, but much improved. Nearby roads are built to a much lower standard and are still frequently impassable. Image: Batur and Trunyan in 2009 set. The village was recent. In 1967 it had not existed and in 1980 a warung was the sole commercial establishment. This warung, typical of the style in Bali at that time, was the only commercial establishment in Toya Bungkah in 1980. I slept in this guys home. It was an obviously poor village with the children spending their days tending to cows that aren't kept there any more. These kids spent their days cutting grass for the cows and didn't attend school. I don't know if all the kids go to school today but there are plenty of people here in their twenties who didn't and weren't taught to read. Today Toya Bungkah looks reasonably affluent but the surrounding area remains poorer than you will see elsewhere in Bali. Apart from the climb, the principal attraction of Toya Bungkah is the hot springs which the locals use as a communal bath. The public facility was pretty good in 1983 but has been developed and privatised so that there are now several facilities exclusively for tourists, some quite expensive. There is one new facility next to the car park that is free for Toya Bungkah residents and Rp50K for all visitors including Balinese. The hot springs were a well constructed public facility in 1983. The privatised facility on the site of the previous public facility, US$16 for foreigners and Rp40K for Indonesians. Toya Bungkah residents don't go here. 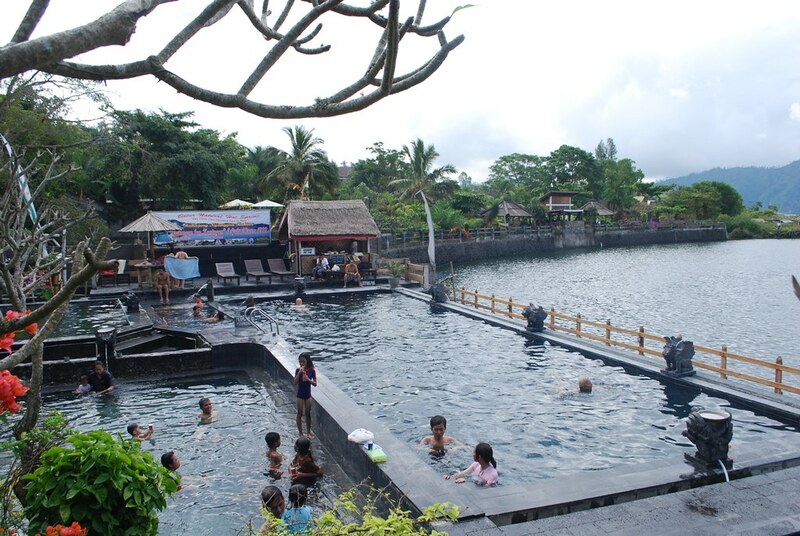 The Ayu hot springs facility, with accommodation and Bali's only camping ground. Upmarket and exclusively for tourists and the wealthy. With the climbing team at the facility near the car park. Free for Toya Bungkah residents and Rp50K for everyone else with a welcome drink. 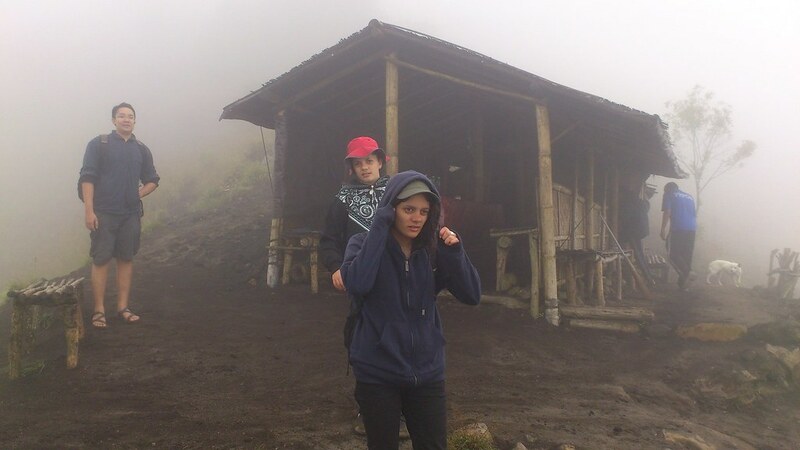 Image: Climbing Gunung Batur set. In 1980, I climbed from around 3.00am to view the sunset from the summit which I've repeated several times since, on most occasions without a camera. Image: Gunung Batur Climb set. 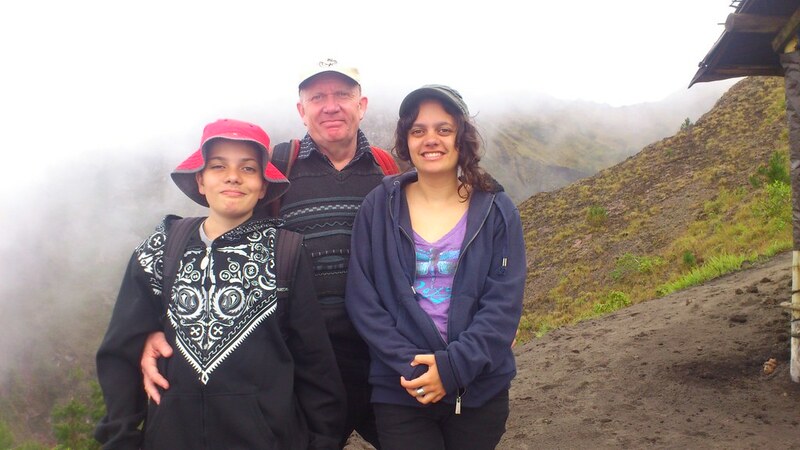 Near the summit in 2012 with children not much younger than I was on that first climb. 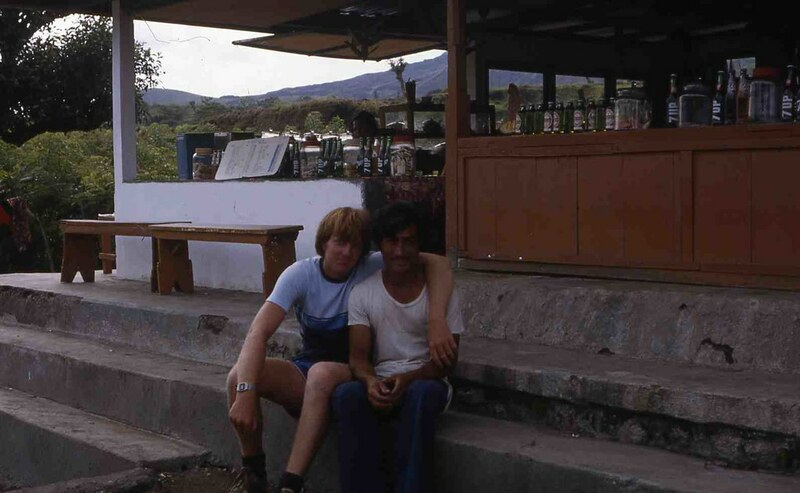 There was no warung at the summit in 1980 but there was in 2004. Climbers resting at the summit warung in 2004. 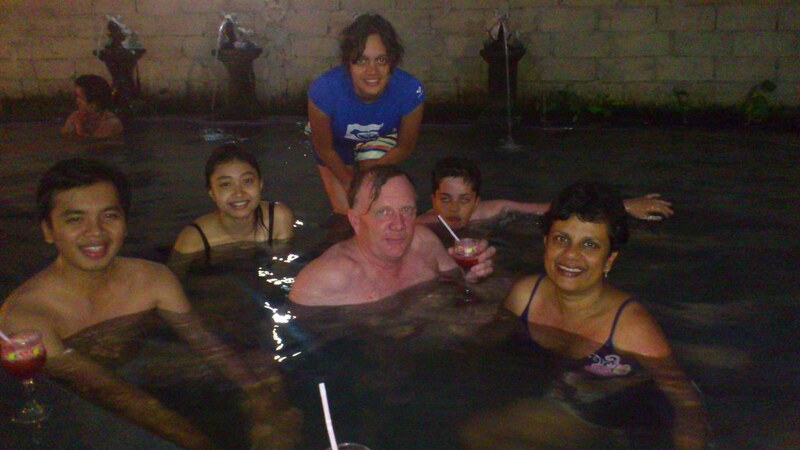 Our party at the summit warung in 2012. Across the lake is Trunyan. It is a long way to the shore and I found this hollowed out log unstable and scary. Operating the camera while expecting to be in the water at any moment was tricky. You can drive on a rough track to Trunyan now but still need a boat to get the last few hundred metres to the cemetery. 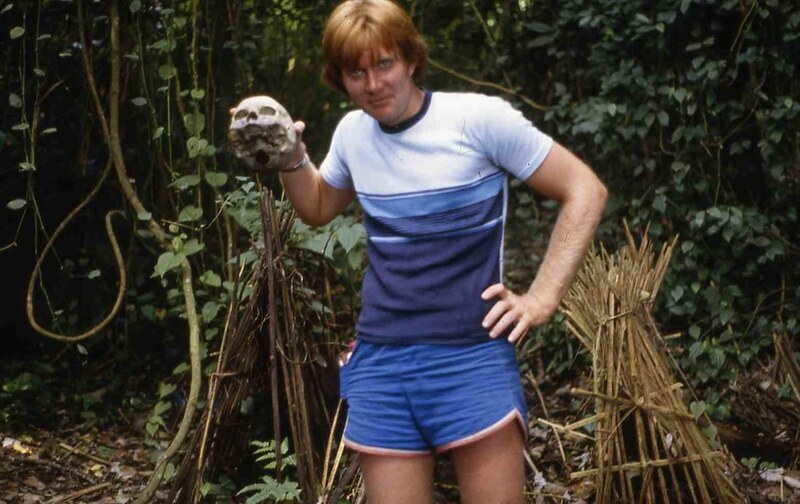 In 1980 it's bizarre cemetery had seemed exotic, though a bit unsavoury. Most climbers don't go there but lots of tour groups do from the wharf in Kedisan. I went back recently, to see what's changed and it's not a lot. Even in 1980, charging visitors to ogle grandmas remains was an income source for Trunyan. It's easiest to pay up. Most climbers are brought directly from Ubud with the 40km drive being traversed in well under an hour when travelled in the early hours of the morning. A guide will be included in the package. You climb, swim and return with only pleasant experiences but are a little divorced from the locals. If you sleep nearby, particularly if you stay a few days, you will get a more grounded experience. 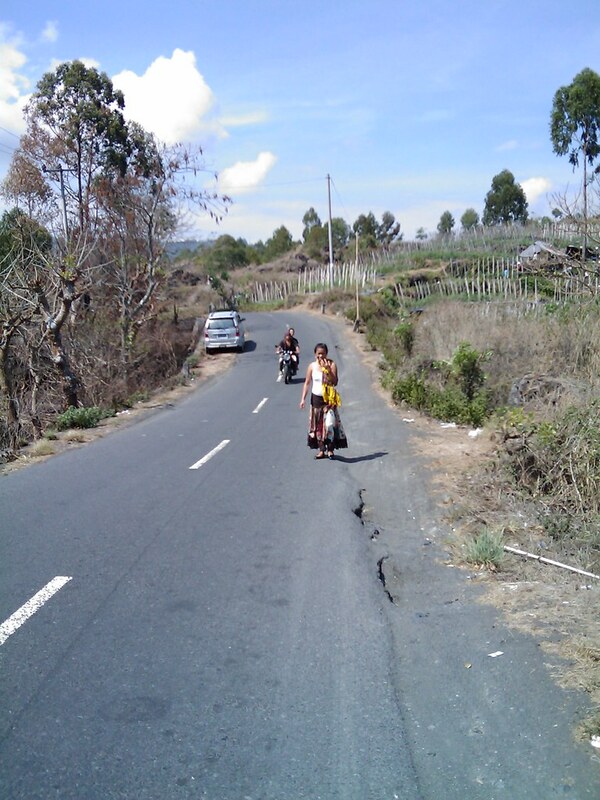 This can be confronting as there is poverty and hassling, but you will see a different side of Bali with many people I've spoken to around the caldera claiming never to have been as far as Denpasar. For the climb you will be strongly encouraged to hire a guide. It may seem compulsory but it isn't and lots don't. We checked in at the police station in Penelokan before descending into the caldera and checked back out on departure which my local colleague said was the norm though I'd never done this previously or heard of anyone anyone else doing it either. Keen for reassurance from the police, we were also advised we couldn't be forced to hire a guide even when climbing with bule. Batur rates as Number 4 on a list of the Top 5 worst tourist rip - offs around Asia which states "Mount Organized-tourist-extortion is a good name for it." 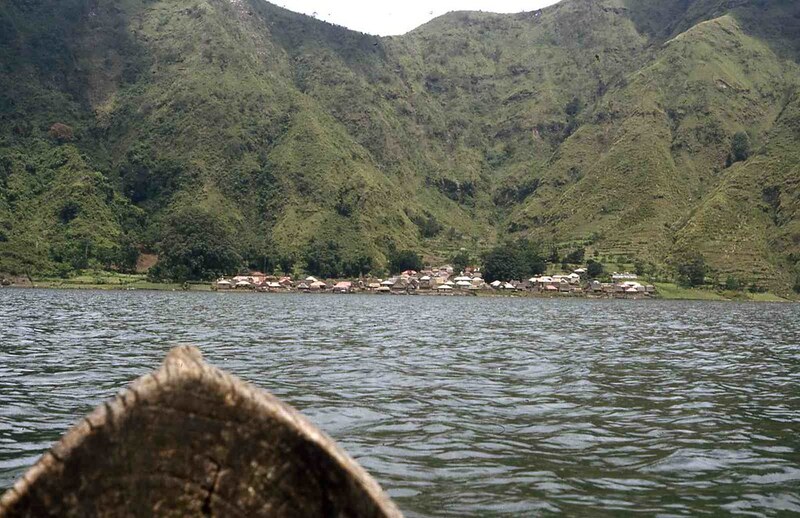 The Jakarta Post reports "Anecdotal evidence says episodes such as these have been occurring around Kintamani and Lake Batur for some time, shaking the foundations of an important economic stream – tourism – for the region." and Trip Advisor documents some confrontations. While I found Toya Bungkah pleasant in 1980 the guy that took me across to Trunyan kept telling me he feared extortion at Trunyan. This is is consistent with a quote from pg 19 of Custodians of the Sacred Mountain; Thomas A. Reuter; University of Hawai‘i Press; 2002; Travelers’ testimonies warn that local men may extort money from passengers by rocking their shaky boats as they ferry them across the lake. Authors of tourist guide books, who generally propagate romantic visions of smiling Balinese, have propagated the image problem of the hill people by characterizing them as “hostile, scruffy hustlers” (Winterton 1989:157–158) and as a potential “hassle” to those wishing to enjoy the natural beauty of their mountain home (Darling 1990:156). "Ever tried walking up Mt. Batur alone? 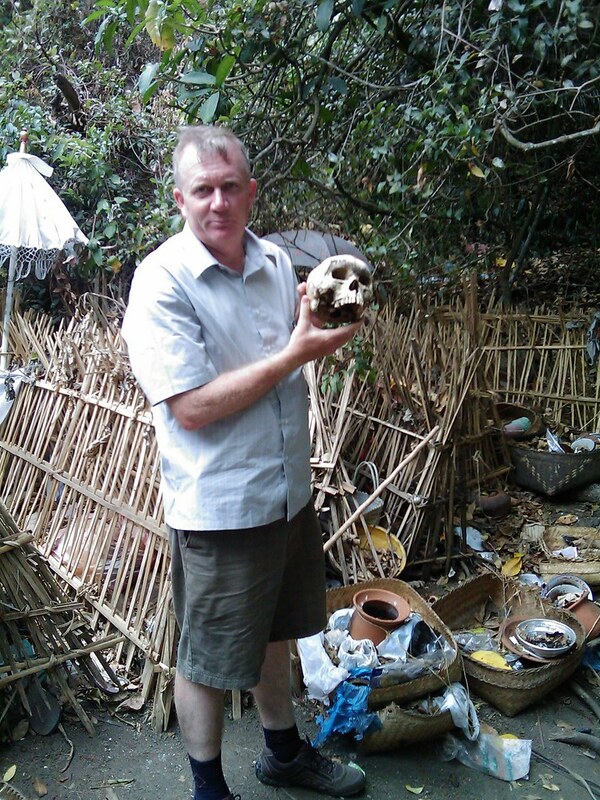 Try it and you'll get extorted by machete-wielding locals that demand you pay them $50 to be a guide." reports one climber from July 2004 showing it's not a recent phenomenon. No one likes extortion (essentially taxation by non government entities), but it's most common in exploitative social systems when governance is weak. Modern China is sometimes described as a kleptocracy and under Suharto this was an apt description of Indonesia which weakens government authority. While Indonesia has been rapidly changing, these are strong traditions extending back to Dutch rule and they are more obvious in Batur than some other places. Apart from natural beauty, the area has limited resources and a long history of exploitation as discussed in Custodians of the Sacred Mountain; Thomas A. Reuter; University of Hawai‘i Press; 2002. This leads to distrust of authority and widespread opposition to taking advantage of opportunities like geothermal energy which will impact many but from which only a few elite are likely to benefit. The best assets are privatised by the politically influential and the poor barely get by labouring at agriculture. The only ways to escape hardship are to leave or exploit and with the best assets already taken, only services remain. Many tourists will pay sums for half a days guiding that would otherwise require several weeks of agricultural toil to earn. Others stay away. In the absence of strong governance, groups emerge to capture the opportunity and without official authority, ultimately resort to stand over tactics to get their way. This is the environment that has bred the guiding cartel whose members can expect to do well as long as the monopoly can be maintained. One guide told me they have 63 members and work is divided amongst the members with each guide going to the bottom of the list after each job. My informant said they averaged 20 climbers a day. While pricing is variable, they have strong pricing discipline, in my case, only dropping the guiding offer to Rp280,000 after things had become so unpleasant that hiring a guide at any price was unlikely. This can only be possible when they are effective in suppressing competition. Batur's climbers are a mere quarter of 1 percent of Bali's visitors of 2.8 million in 2011. Guides from elsewhere will usually bring tourists only as far as Kintamani for the view from the caldera rim and will not offer the climbing opportunity. The road into the caldera is tough on their vehicles, so much so that I've known drivers to refuse the descent, and they are not keen to share guiding revenue with their colleagues in Toya Bungkah. While much effort goes into maximising revenue from those that turn up, there is little obvious effort on promoting the climb. Climbing is not everyone's thing but there is surely an opportunity to increase Batur's current visitor numbers. One tourist in a hundred ought to be easy. Working against that is the community inequality, coercion and distrust of government that makes it difficult to achieve more cooperation and investment in shared infrastructure, particularly roads, that would be required to attract large visitor numbers. 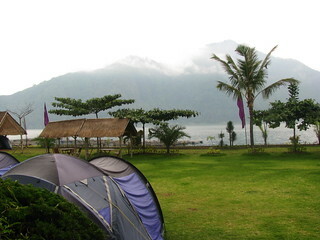 The guiding association's ambition of Batur being an upmarket experience, is consistent with Governor Pastikas view that Bali should be an expensive destination but it is incongruous for the opulence of the Ayu resort to be in stark contrast with the poor roads, poor infrastructure and obvious poverty over the fence. With electricity and good mobile phone/internet reception Toya Bungkah is already not that weird "other world" I experienced in 1980 but increased development would mean losing some of the current atmosphere in the same way as Kuta has lost the atmosphere it had in 1980, as visitor numbers increased. Locals would welcome better roads and increased opportunities. Most visitors coming up for the day from Ubud probably wouldn't notice what was lost. While Kuta sadly destroyed much of its natural beauty as it developed a different sort of magic has emerged from the mayhem and the Kintamani region could develop its own different sort of magic and even maintain it's awesome natural assets. 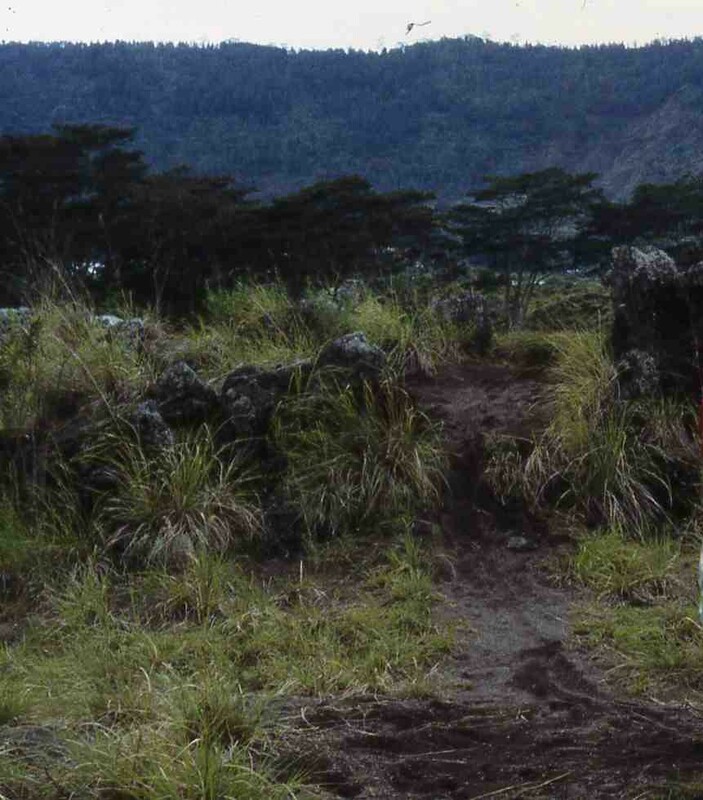 In 1980 when I first visited, Batur was pristine, probably because visitation was infrequent. On intermediate trips it was a free for all, covered in rubbish. 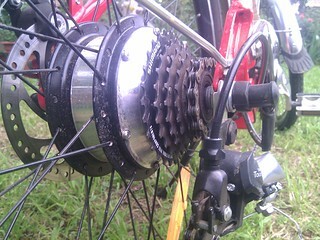 Today it is clean, neat and not overbuilt. Someone must be responsible for this improvement and the new hot springs provide a facility rivalling that available to Toya Bungkah residents back in 1980. The guiding cartel at least benefits locals rather than absentee landlords. I've climbed without a guide as have others. The hassles will be at the base of the climb. Once you get part way up you are unlikely to have trouble and drink sellers may offer unofficial guiding services. You will need a flash light which can be purchased cheaply, some warm clothing and ideally rain protection. If you are self driving/riding avoid vehicle damage by leaving your vehicle at the hotel rather than the car park at the base of the climb. One guy who suffered vehicle damage thought the cost of tyre repairs was still a bargain compared to guiding fees. Gentle persuasion will be tried first and be prepared for a forceful discussion and to resist strong demands. Some people have reported violence and though I experience fear arguing with strangers in the dark I don't think it usually gets too violent; or else I've been lucky. You might not get much immediate help in a confrontation but extreme violence seems unlikely and I've not heard of robbery. Confrontation is unpleasant and leaves a bad taste but once on the mountain a nice camaraderie develops and even the guiding fraternity seems not to hold a grudge. Be careful looking down the 150 metres into the crater from the precipice near the bat cave (see the map) as at least one tourist fell to their death. I wouldn't want to be having an argument on this unfenced precipice. Most of all, enjoy the experience because the view is great after it's earned and there's lots to do and see along the way. 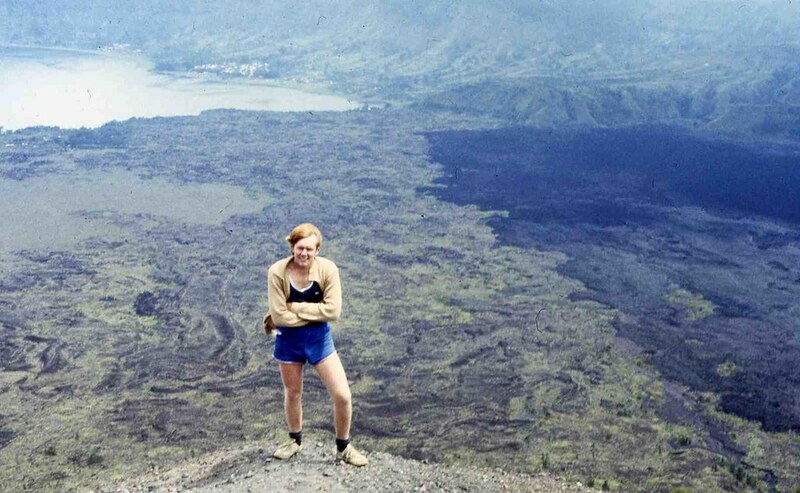 Image galleries showing beautiful images of Batur, beautiful images of the surrounding area, and most interestingly changes from 1967 around Batur including changes in the shape of the cone due to lava emitted from Batur's frequent eruptions. Image sets showing Gunung Batur - in the past, a Gunung Batur climb from 2005, Batur and Trunyan in 2009 and Climbing Gunung Batur recently. 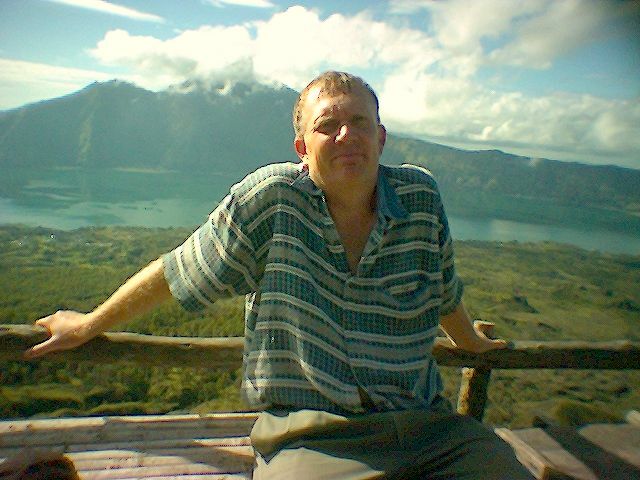 Lots of traveller reviews of Batur and surrounding areas on Trip Advisor.